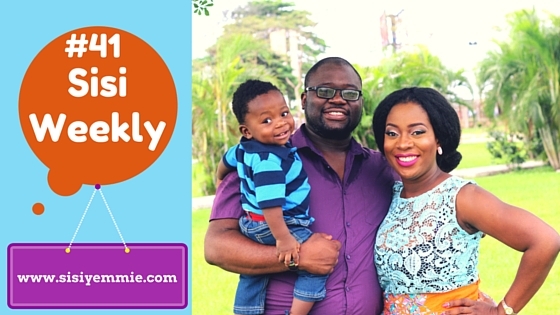 LIFE IN LAGOS : SISI WEEKLY EP #41 "NEXT STOP PORT HARCOURT!" I've had a very busy week and it's a good thing! In this vlog we are still in Port Harcourt and I show you what I get up to in the city. Enjoy the vlog and don't forget to SUBSCRIBE so you can stay ahead and get my videos before anyone else! Ps. If you have any question you've ever wanted to ask me you can leave it in the comments or send me an email sisi@sisiyemmie.com and I'll respond in a Q&A post during the week! Hi sisiyemmie, hope you had fun at portharcout? No need to a if you enjoyed your daycation at Intercontinental Hotel because from the video you posted it shows you did. Bet we should b expecting baby no 2 *wink*. Enjoy the rest of your day. Well done Sisi....keep it up!!! Eku ! enjoyment sisie ! All the goodies at 12:05! You didn't tell us the occasion, or did I just miss it? I guess there's not even any need for a formal occasion because as long as there is family and life, then there will always be a reason to celebrate. The blog was on POOIINT as usual! Sisi start planning your move to Houston oh, I've already started a Sisi Yemmie committee down here! We're waiting for you to grace our presence as the Patron of the group! lool. Love you and your work always. enjoyable vlog! weldone sisi. My question: What does Bobo do for a living? Amebo. How it take concern you??!!!! I think he's working as a doctor outside the country, or is it architect, wait o, I done forget. please share Vera's business details o. we want to buy sisi yemmie top too o.
Effurun market never change o. Nostalgic, haven't been in warri in over a decade. Enjoying your south south touring. Where is the next stop? Port-Harcourt!!! I miss this town. Grew up in ph and life has now thrown me to Lagos!!!! There is no place like home!